I have to admit, I'm a sucker for commentary tracks where the makers of a film claim they were making a movie for children. "Oh!" I think to myself, "It was for children. Well now that is a bit more understandable. After all, isn't it nice when people think of children when making movies?" Well, no, it isn't. Analytically I can say that that is not a good thing. For one, kids need movies like kids need television programming. People talk about T.V. ruining an active imagination and encourage kids to read instead. Because one kills the imagination and the other doesn't? Nonsense! Film, television, and literature all have one effect on the child: they spoil "pure" imagination with reality and consequence. BAMBI killed many children's fantasy that their parents would live forever. HARRY POTTER meshed millions of unique fantasies of children all over the world into a shared language of Hogwarts and Muggles. Let's face it: making any kind of art for children serves only to hasten their transition to adulthood and death. So there, now that I've pulverized the only good thing I had to say about this movie (I believe the Marxist term is auto-critique) I can mention just a few of the many reasons it's awful. Dana Carvey's ego. He's kinda of like the white version of Eddie Murphy in that both men think that they are the funniest things to grace the silver screen and thus should play every part and get every joke in their comedies. What is noticeably lacking in this scheme is any kind of chemistry between the leading man and any other actor in the film who can never rise above second-fiddle. Thus the romantic interest is a gorgeous but impersonal dummy (on the commentary track they laud her "straight man" skillz). But there's also no tension between the hero and villain (the latter, Brent Spiner, is reduced to farting throughout the film). So, if we can appreciate the general reasons why this film stinks, all that's left is to consider its plot: a series of skits in which Carvey is dresed up in various costumes affecting his voice. The only of these that made me giggle in the least was the "Turtle Guy." 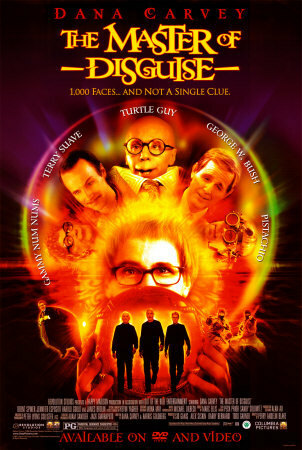 There's one totally surreal moment in which Carvey emerges from his "shell," lunges at a businessman, bites off the man's nose, and then spits it back onto his face. That was pretty funny.